Land defenders in Guatemala. Images courtesy of Saul Paau Maaz. Investigations into the ecocide and the murder of Rigoberto have not advanced. And just as recently as last month human rights defender Saul Paau Maaz, public spokesman for the Commission for the Defense of Life and Nature of Sayaxché, was the latest target of apparent intimidation by REPSA employees. At a private Commission meeting, REPSA employees showed up uninvited accompanied by three unknown individuals. It was later reputed that the unknown individuals were hired assassins, there to allegedly attack Saul. The best way to defend our lands, rivers and forests is to speak out for the defenders — the people at the front lines of these struggles — so they may live on to continue fighting for all of us. This threat is one of several that are highlighted by AmnestyInternational in a new digital platform called Speak out for Defenders! that makes visible the dangers faced by territory, land and environmental rights defenders in Latin America. The platform was launched last week in recognition of December 9, International Human Rights Defenders Day — the anniversary of the UN Declaration on Human Rights Defenders. 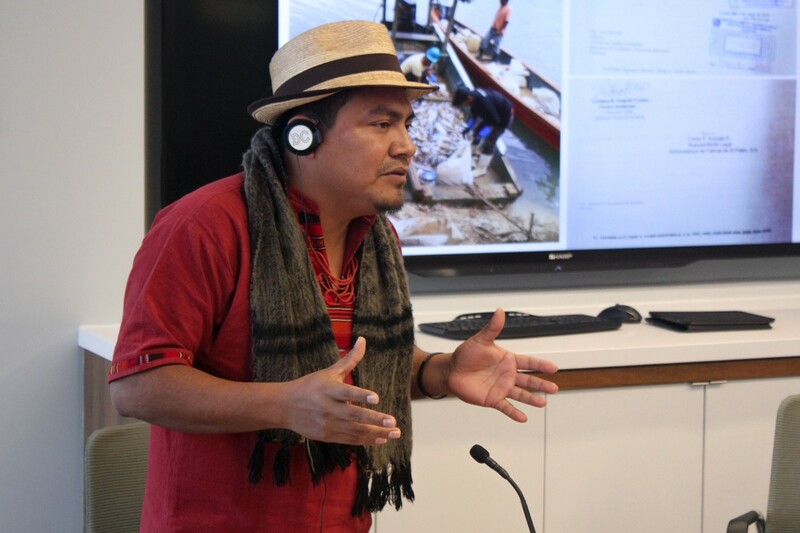 Saul Paau Maaz speaking to Friends of the Earth about the a mass fish die-off in Guatemala, April 2016. Photo credit: Josette Matoto. Read the letter to the Guatemalan government.